Boasting a rooftop pool and a sun deck, Miloft Sathorn Hotel is a short walk from the Chao Phraya River in Bangkok. The hotel is located within a 5-minute drive from ASIATIQUE The Riverfront and a 10-minute walk from BTS Saphan Taksin Skytrain Station where guests can easily access to various attractions. Free WiFi access and free private parking are available at the property. All rooms and suites at Miloft Sathorn Hotel come fully-furnished with air conditioning, a sofa seating area and a flat-screen satellite TV. There is also an electric kettle, a safety deposit box and a bathtub or shower in the private bathroom. Suites include a dining table and some of them have a kitchen with stovetop. 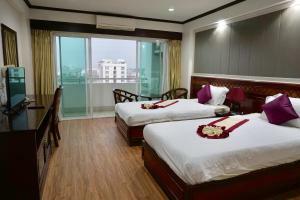 The hotel features a 24-hour front desk with concierge services and there is a fitness centre. Popular international dishes and local cuisine are served at the on-site restaurant. Room service is available. Just a 10-minute skytrain ride brings guests to several shopping malls including Siam Paragon, Central World Plaza and MBK Shopping Centre. Suvarnabhumi International Airport is a 45-minute drive away from Miloft Sathorn Hotel. Please inform Miloft Sathorn Hotel in advance of your expected arrival time. You can use the Special Requests box when booking, or contact the property directly with the contact details provided in your confirmation. Guests are required to show a photo identification and credit card upon check-in. Please note that all Special Requests are subject to availability and additional charges may apply. Payment before arrival via bank transfer is required. The property will contact you after you book to provide instructions. Air-conditioned room offers a seating area, a private balcony and an en suite bathroom. 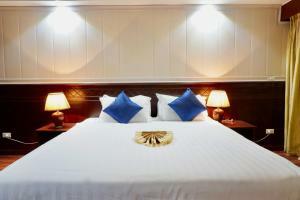 Rate: THB 1320.00 ... THB 7500.00; select dates below to get current rates. Features a separate living room. Features 2 bedrooms and a living room. Spacious suite offers a separate living area, a satellite TV and a private balcony. En suite bathroom comes with shower facilities.